On November 13 we had the great opportunity to hold our first alumni event of the year. DAC students worked together to organize the panel. We heard from Sam Hogerton – Founder, VP, and creative at SRH; Allison Mayenschein – Event and Social Media Coordinator at Ixonia Bank; Kelby Fritz – Back-end Developer at Hoffman York; and Kara Dorn – Marketing Production Assistant at Burczyk Creative Group. Students who attended the event had the opportunity to hear about life after graduation, how they have used skills and knowledge from the DAC program in a wide variety of jobs and careers, and receive general advice from these amazingly talented and successful fellow Panthers. One of the things that has changed since these alumni have graduated is the introduction of the DAC major, rather than just the certificate, which previously was the only DAC program option. Kara described how she really liked seeing that the DAC program now allows you to build a well-rounded degree, without having to choose between double or triple majoring. We asked how DAC prepared them for life after graduation. They all agreed that DAC gave them the mindset to never stop learning. They described that in their jobs right after graduation as well as current positions they are faced with a digital world that keeps evolving. Part of the job is acquiring new digital skills. Another legacy of DAC is instilling in its students a curiosity about the world and lack of fear for experimentation. DAC facilitates a variety of experiences and subjects and panelists implored students to not be afraid to try something they are curious about. Senior Lecturer and DAC Director, Marc Tasman, who was also present during the event, shared a little bit about the history of DAC and why the program is more relevant now than ever as the gig economy grows and more people have experiences working as independent media professionals. All of the alumni could backed up this assertion that these DAC skills are really important at a time when fields involving media, technology, and society are changing rapidly. What they do in their day-to-day work life has changed and continues to change, but that’s one of the things the panelists see as gratifying and enjoyable about the work that they do. A huge thank you goes out to our alumni speakers for coming back to UWM and sharing some of their time with the Digital Arts and Culture community! 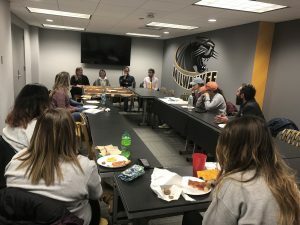 This semester we have been working on promoting and reaching out to students and the UWM community in general to share more about the DAC program. We invite everyone who is considering DAC as part of their studies to ask us about what we see as the benefits and strengths. If you want more information about the DAC program send an email to dac-info@uwm.edu.